Williams has been accused by the feds in a 23-count indictment of bribery, extortion, mail fraud and honest services fraud. He has agreed to a voluntary suspension of his law license. But the D.A. has rejected pleas from the governor, the mayor and the bar association to step down before he goes to trial. Williams has pleaded not guilty to all charges. In an April 27th email to the judge, Catherine M. Recker, a lawyer for First Assistant District Attorney Martin, said that her client "has no desire to delay the filter review process." For almost a year, Recker wrote, Martin has been cooperating with the federal investigation of her boss, "providing the government with all requested documents and information." Martin, however, "wants to ensure that the [filtering] process adequately protects the secrecy of any grand jury proceeding." Recker told the judge that Pennsylvania state law required that the state's supervising grand jury judges "must be consulted" before any such search. And that any search terms provided by the D.A. 's office might themselves breach grand jury secrecy rules. But Judge Diamond didn't seem to be all that worried about any of that. When he ruled against the D.A. 's office, Judge Diamond stated that the U.S. Attorney's Office "has further suggested that requiring an unspecified number of state judges to review an unspecified number of documents would likely delay trial in this matter, currently set to begin on May 31st." In his order, the judge noted that when he denied the U.S. Attorney's motion to designate the case against Williams as complex litigation, "I emphasized the pressing public need for a speedy trial in this matter," the judge wrote. "The defendant -- who presumably knows what is in his own emails -- has not suggested that they contain confidential grand jury materials." The judge said that even if the search terms provided by the D.A. 's office "slip through" the filtering process to be conducted by the separate prosecutor, "the few that slip through would be made available only to the Government's case team, not to the public," the judge wrote. "That incidental, very limited disclosure would not implicate the reasons for state grand jury secrecy." In his order, the judge wrote that if the D.A. 's office refuses to comply with his order by noon Monday, the separate prosecutor will proceed with the filtering process of the D.A. 's two email accounts using search terms supplied by the city and the defendant. In addition to any grand jury investigations, the feds wrote the judge on April 26th, the D.A. 's two email accounts may contain confidential communication between Williams and several lawyers. "Since at least May 2015, Williams has sought and/or obtained legal advice from attorneys Scott DiClaudio, Matthew Haverstick, Robert Levant, John Pease and Samuel C. Stretton regarding the FBI's and IRS-CI's investigation of Williams and the amendment of Williams's financial disclosure statements," wrote Acting U.S. Attorney William E. Fitzpatrick, and Assistant U.S. Attorneys Robert A. Zauzmer, Vineet Gauri, and Eric W. Moran. "Williams also may have sought and/or obtained legal advice from attorneys regarding a possible civil suit by [former Assistant District Attorney] Laurie Malone regarding her demotion by Williams at the DAO," the feds wrote. 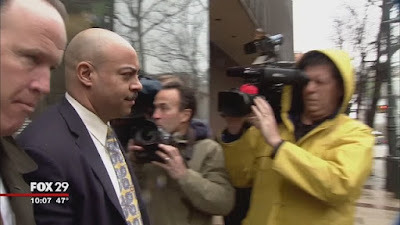 In his order, the judge made it clear that it's full speed ahead with the federal corruption trial of Rufus Seth Williams, scheduled to begin May 31st. The urgency for the trial, the judge has previously said, is because Williams has refused to step down as D.A. The D.A. 's defense lawyers have certainly gotten the message. On Friday, Thomas F. Burke, the lead defense lawyer for Williams, wrote the judge that the defense is prepared to go to trial on May 31st. Even though to date, Burke wrote, the feds have turned over 147,999 documents that the defense lawyers are still plowing through. This would be too good to be true, but I wonder if there is any correspondence between Rufus and Billy Doe's mouthpiece. We can only hope. @Anon 12:15am - another regular anonymous poster continues to believe that Kathy Martin's consternation revolves specifically around this type of issue. If not direct correspondence, then quite a bit of grand jury abuse. That would go beyond the Lynn case but also cover, for example, the collapse case. One potential reason for her concern not being shared with Williams? Let's be practical. Williams is likely facing 20 years. He's far short of the 137 or so counts Fumo was facing, but the impact of selling the DA's office is far more serious. A few more counts won't change much at this point and there's no benefit to him in obstructing justice. Little could change that would put him in for any longer than 20 (despite technically facing a max of about 310 years). At the DAO, though, you have a lot of law licenses on the line if any abuse extended beyond Williams. One would hope that the FBI looks at Seth's history of Facebook activity including his friend connection with a Archdiocese employee in a key role and position of power. Kathy Martin < J.Diamond. Carry on.